Ethernet is a standardized way of connecting computers to create a network. It specifies what kind of cables to use, how to connect the cables together, how long the cables can be, how computers transmit data to one another using the cables, and more. Ethernet has become the most popular wired local area network standard. While maintaining a low cost, it has gone through six versions, most ten times faster than the previous version (10 Mbps, 100 Mbps, 1 Gbps, 10 Gbps, 40 Gbps, 100 Gbps, and in the works 400 Gbps). You can purchase inexpensive Ethernet components at just about any computer store, and you can even purchase Ethernet cable and connectors at many hardware warehouse stores. Because Ethernet is inexpensive and readily available, it is really the only choice for new networks — small as well as large. The outer sheath of both shielded and unshielded twisted-pair cable comes in two varieties: PVC and Plenum. PVC cable is the most common and least expensive type. Plenum cable is a special type of fire-retardant cable designed for use in the plenum space of a building. Unfortunately, plenum cable costs more than twice as much as ordinary PVC cable. Most local building codes require that you use plenum cable whenever the wiring is installed within the building’s. Ethernet cables are used for connecting devices on LAN (Local Area Network) such as switches, routers and PCs etc. These cables have three major kinds namely; Straight Through Cable, Cross over Cable and Rolled Cable. The classification of the cables into three types originates from the difference or the way in which they are wired, the manner in which pin-to-pin connection is held. Straight-Through cable are most commonly used to connect a host to client. 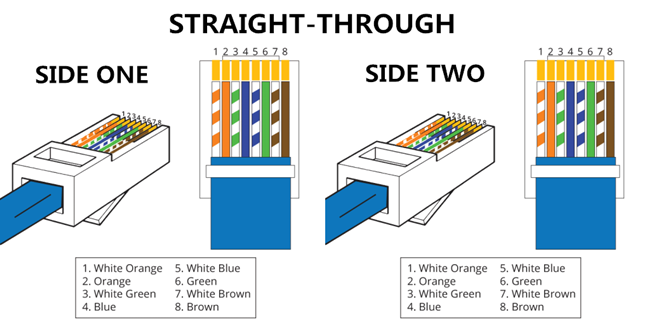 The straight through is the most common type and is used to connect computers to hubs or switches. They are most likely what you will find when you go to your local computer store and buy a patch cable. A straight through cable is a type of twisted pair cable that is used in local area networks to connect a computer to a network hub such as a router. This type of cable is also sometimes called a patch cable. On a straight through cable, the wired pins match. Straight through cable use one wiring standard: both ends use T568A wiring standard or both ends use T568B wiring standard. The following figure shows a straight through cable of which both ends are wired as the T568B standard. 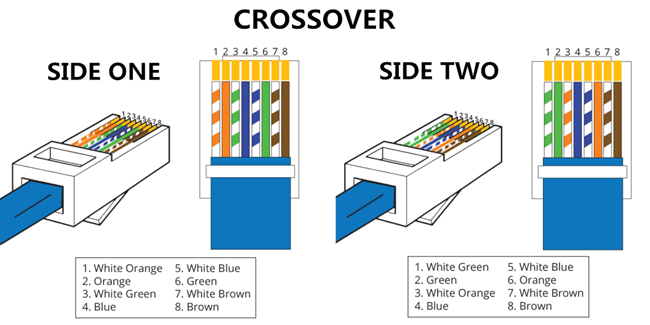 A crossover cable is a cable that can be used to directly connect two devices without a hub or switch. You can use a crossover cable to connect two computers directly to each other, but crossover cables are more often used to daisy-chain hubs and switches to each other. 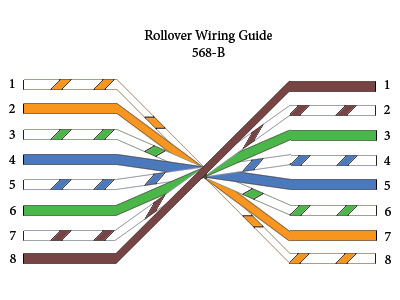 Unlike straight through cable, crossover cables use two different wiring standards: one end uses the T568A wiring standard, and the other end uses the T568B wiring standard. The internal wiring of Ethernet crossover cables reverses the transmit and receive signals. If you want to create your own crossover cable, you have to reverse the wires on one end of the cable. Note that you don’t need to use a crossover cable if one of the switches or hubs that you want to connect has a crossover port, usually labeled uplink or daisy-chain. If the hub or switch has an Uplink port, you can daisy-chain it by using a normal network cable. 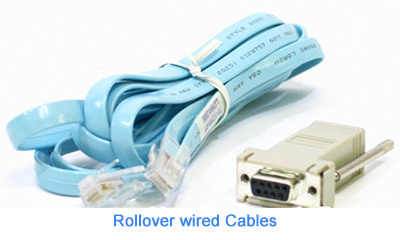 Rollover cable (also known as a Yost cable) is a type of null-modem cable that is often used to connect a computer terminal to a router's console port. This cable is typically flat (and has a light blue color) to help distinguish it from other types of network cabling. Rollover wired cables most commonly called rollover cables, have opposite Pin assignments on each end of the cable or in other words it is "rolled over". Pin 1 of connector A would be connected to Pin 8 of connector B. Pin 2 of connector A would be connected to Pin 7 of connector B and so on. Rollover cables, sometimes referred to as Yost cables are most commonly used to connect to a devices console port to make programming changes to the device. Unlike crossover and straight-wired cables, rollover cables are not intended to carry data but instead create an interface with the device.